The Earth Day - which by accident is also my Birthday :))) - is the great time to present news about amazing event taking place on one of the most beautiful islands of our Gaia - Hawaii. The 2nd Annual Alchemeyez Visionary Art Congress will be held May 13-15 at the Hilton Waikoloa Village on the Big Island. I have a kind request to scientists (not necessarily representing orthodox science) working on teleportation, please send me a prototype, any prototype, so that I can port myself to Hawaii in two weeks. This is the type of event one has to experience directly. The event is a festival and conference uniting people from across the globe around the idea that visionary art forms can heal and strengthen the collective spirit of humanity. 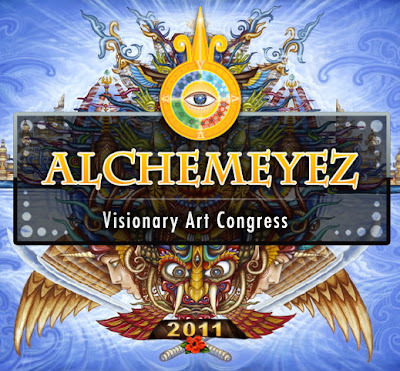 With well over two-dozen visionary artists and more than thirty-five musical acts, Alchemeyez promises to excite and inspire boundless creativity in those who attend.